The school year is right around the corner. Who’s excited? I know I am! Going to school everyday means that if you have a pet, they might get lonely. So when you get home from school or work you should play with your pet, or just acknowledge that they are there. Petting them or giving them a treat will really make them feel appreciated. Watch my Responsible Pet Ownership video to learn about more ways that you can be a responsible pet owner! I hope everyone has a great school year! If you have any questions or know someone who has done something to help animals, please email me at CKGJessica@ct.kidgovernor.org. Have a great day and make sure to help animals, those without a voice! This month has been lots of fun. I have been helping some of my teachers with things in school. I am also still working with my 5th grade teacher, Mrs. Stuart, on our proposal for getting therapy dogs into the Milford Public School District. You can read about our work so far in my last blog post. So far, we are doing great! Did you know that therapy dogs can solve lots of problems that are physical, mental, social, emotional, and they can even help with health! They can do all of this while looking adorable. Did you know that 44% of kids from the ages eight to eighteen have trouble sleeping caused by stress? Well dogs can help with these problems. They are able to help teens and kids calm down and focus. Dogs are very powerful when it comes to helping. I'm also looking out for some people doing great deeds for animals. One lady named Alice creates items for the animal shelter to give to the animals. She makes dog toys, cat toys, rabbit toys, and even bird toys. She is definitely making animals happy! 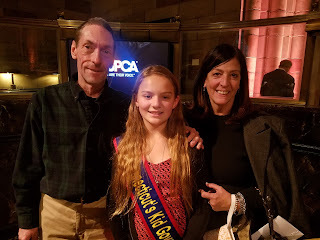 If you would like to hear you or a friend in a shout out like this, email me the great things you or others are doing for animals at CKGJessica@kidgovernor.org! Remember to help animals, those without a voice! I have been doing quite a bit of work this month. Currently I am working with my 5th grade teacher, Mrs.Stuart, on getting therapy dogs into the Milford Public Schools District to help with things like stress, anxiety and even reading comprehension. I have been researching the benefits and concerns to having dogs in school. 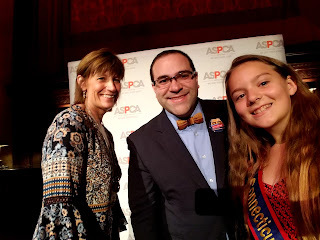 Me with Mrs. Stuart, my fifth grade teacher, last year at the ASPCA Humane Awards. One example of a benefit for having a dog in school is if a child has a reading disability, like dyslexia, they can sit down next to a sweet, calm, patient dog and try to read slowly. This is good because when a child gets stuck on a word they can keep working at it a find it out without being rushed. But when you are with another student or even with an adult you can feel rushed by them causing even more stress. When you get stuck on a word in front of your friends you might get embarrassed but when you stumble in front of a dog it’s no big deal. One of the downsides might be a cultural difference*. This might be a problem because certain cultures don’t like dogs. Now there are ways to take care of this, like having the children that don’t like dogs at a distance from dogs and to not talk about dogs in front of them. I can’t wait to do more work and research. I hope we can get dogs into the Milford Public Schools District. I hope everyone is great! Remember to help animals, those without a voice! Along with cultural differences, dogs and pets may not be allowed into schools due to allergies. Some people may be allergic to dogs and dog dander. These allergies may cause severe reactions that range from a runny nose to swelling of the eyes and throat. Dogs that are service animals or police dogs are allowed into schools though and there are no laws to prevent them from entering a classroom. You should always alert the school first to make accommodations for those with allergies. 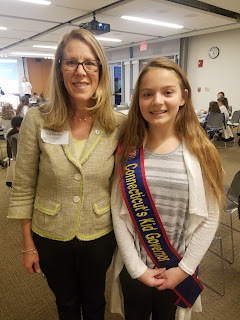 2017 Connecticut's Kid Governor Jessica Brocksom ended her term last week at the inauguration of the 2018 Connecticut's Kid Governor Megan Kasperowski. Jessica reflected on her term, shared well wishes with Megan, and thanked all who helped her this year. You can read her farewell address below and watch it here. in the Courtroom of Connecticut's Old State House. Good morning everyone! A special welcome to Secretary of the State Denise Merrill, State Senator Art Linares, State Representative Christie Carpino, Commissioner of Education Dianna Wentzell, Supreme Court Justice Emeritus Dennis Eveleigh, Portland First Selectwoman Susan Bransfield, Portland Superintendent Dr. Philip O’Reilly, and Kid Governor-Elect Megan Kasperowski. Thank you for being here for this special day. I have had a very exciting year as the 2017 Connecticut’s Kid Governor. I would like to tell you all about it, but first I want to give a special thanks to the Connecticut Public Affairs Network. They are the reason that I was able to run to be Kid Governor and help so many animals. And thank you so much Mr. C, Ms. Whipple, Mr. Orcutt, and Ms. Sousa and everyone else for being there every day and helping me along the way. You guys have done so much for me this year and my accomplishments wouldn’t have been possible without all of you. I want to personally thank my fifth grade teacher, Ms. Stuart, for all that she does for me. She is the most amazing teacher that I ever had and I wish all students had the chance to be taught by Ms. Stuart. She was so supportive of me during my term. I thank you for everything you do for me and I wouldn’t be where I am today if it weren’t for you. I really want to thank my family for all of their support for me and bringing me to many events just like this. I am truly grateful for them and I wouldn’t be able to do anything without them, so thank you so much. During my year as your Kid Governor, I had the great opportunity to travel all over the state as well as New York and a special trip to Washington, D.C. During my travels, I was able to meet so many people along the way who are as passionate as I am about helping animals. It’s been amazing to see my platform of animal cruelty awareness not only help many animals, it motivated other people to help as well. I would like to especially thank Senator Richard Blumenthal for inviting me to Washington, D.C. He and Representative Rosa DeLauro and Senator Chris Murphy took the time out of their busy days to visit with me and learn about my platform to help animals. They also told me about their work in Congress and the animal legislation they support. The Humane Society of the United States also met with me in Washington and shared how they help to advocate for animals. I also got to go to New York and had the honor of being recognized by the ASPCA as the Tommy P. Monahan Kid of the Year. The ASPCA is such an important organization and they inspire me to do great things to help animals. Over the year, I was able to meet all three points of my platform and do much more. I met my first goal of helping pass a bill. I was able to speak at a press conference at the state capitol to support a law allowing therapy animals to go to court with kids. The bill was signed by Governor Malloy in July and took effect in October. My second goal was met by coordinating a collection drive and donating many items and money to the animal shelter to help with costs for animal care. I also prompted other kids and adults to do the same and shared resources for planning collection drives in schools. Lastly, I met my third goal of making an educational presentation to spread awareness about responsible pet ownership. That presentation was released this week. There are so many things that you can do to help stop animal cruelty and be a responsible pet owner. I'm so proud of all the people in Connecticut who are helping animals, those without a voice. 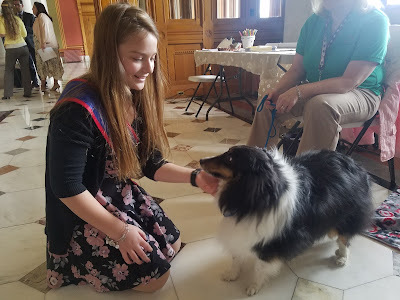 This past year, I went to libraries across Connecticut to teach kids and adults about responsible pet ownership. I helped start a program called Heat Kills in my town of Milford with my State Representative, Pam Staneski. I met with elected officials and news reporters to share my platform. 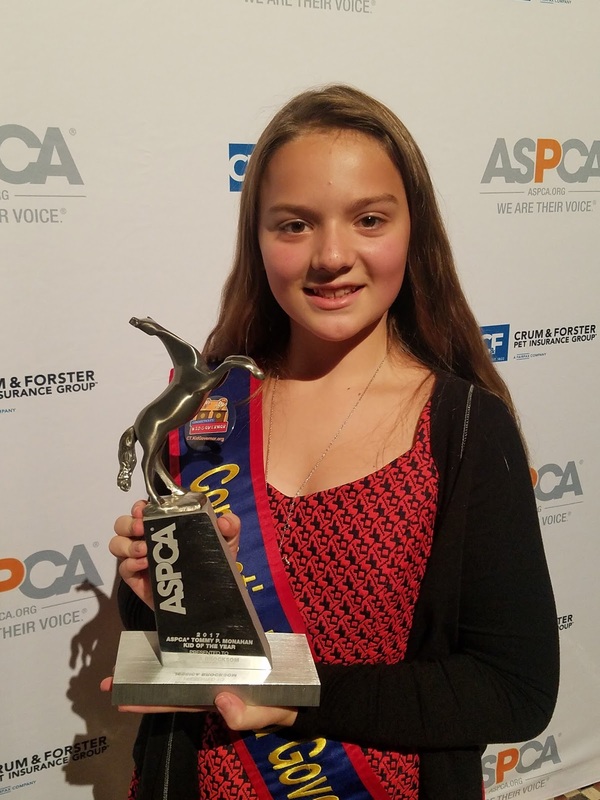 I also kept a blog called Helping Animals to motivate other kids to speak up for animals. In closing, congratulations to our new Kid Governor Megan! You have such a great year ahead of you! You are going to make so many people happy and inspire others. Just don't forget to have fun and enjoy it while you can. It goes by so quickly. I would also like to say “congratulations” to the six other candidates from the Statewide Election! Your campaigns were amazing and I hope that you will continue to spread your messages because they are all very important. Just remember you all can make a difference. Even though my term is up, I will still continue to educate people on animal cruelty and speak up for animals to make sure their voices are heard. Once again, congrats to Megan and the six final candidates. And to everyone, remember to help animals, those without a voice. Thank you and have a great day! 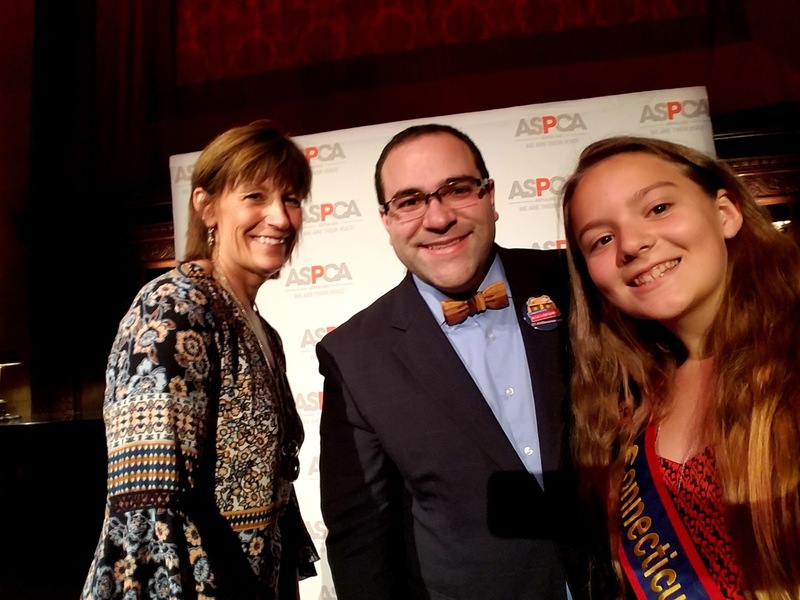 A busy November at the ASPCA's Humane Awards Luncheon and a Ms President US program! Hello everybody! I have had an exciting few weeks. I went to New York for the ASPCA's Humane Awards Luncheon and I went to Ridgefield, CT to speak to a group of girls participating in a program called Ms President US. So let me tell you all about both experiences! My ASPCA Kid of the Year Award! 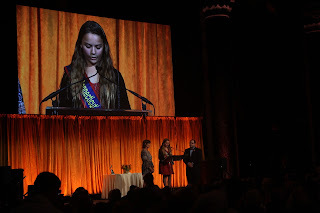 Giving my award acceptance speech on-stage and sharing my work to help animals during my term as Connecticut's Kid Governor. 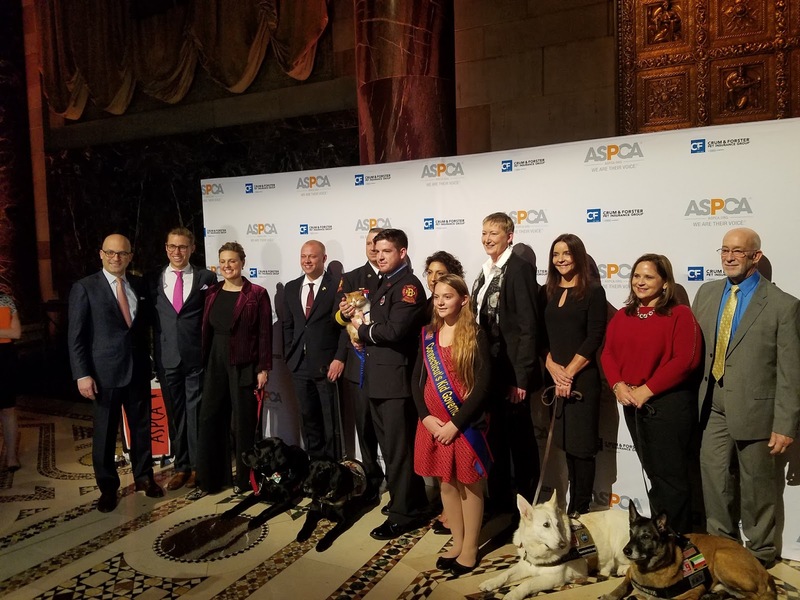 The ASPCA, which stands for the American Society for the Prevention of Cruelty to Animals, holds the Humane Awards Luncheon every year in New York City. They recognize heroic animals as well as people who help animals. The Tommy. P Monahan Kid of the Year Award honors one kid for their hard work with helping animals. I am so honored to be their 2017 Kid of the Year! You can read about all of the 2017 award winners HERE. Me with Tommy's parents, Tom and Maria Monahan. When I went to New York, I met the family of Tommy P. Monahan. Tommy was a nine-year-old boy from Staten Island, NY who went into his burning house to save his dog's life. Sadly, Tommy died in the fire. The Kid of the Year Award is named in his honor, and Tommy's family sat at my table. All of the 2017 Humane Awards recipients (both people and animals!). There are other amazing pets and people being honored, too. Like the Cat of the Year named Flame, and the Dog of the Year named Rescue. Flame was a malnourished kitten who now lives in a fire station and is a pet to all the fire fighters. Rescue lives with Jessica Kensky and Patrick Downes who were both affected by the Boston Marathon bombing. Rescue helps them feel good and makes sure they go out and stay active. These two pets are amazing but wait until you hear about what the other people out there are doing. Selfie with my 5th grade teacher Mrs. Stuart and Mr. C from Connecticut's Kid Governor who attended the luncheon with me. The human winners were Judy Obregon who received the Citizen Hero Award, the Mission K9 Rescue who received the Henry Burgh Award, and Elaine Nash who received the Equine Welfare Award. They have done so many great things for animals. They all have been saving hundreds of animals and it's unbelievable. The ASPCA Awards were amazing and it was such a great opportunity. I am so inspired from all the stories that I heard there and I hope you all are too. What these people have done for animals is beyond any expectations. They are truly amazing. I had such a great time speaking and meeting new people. I especially loved meeting the family of Tommy. P Monahan. They were so kind and sweet. I thank them and the ASPCA for this huge honor. Me with Ms. Liz Osterhus Fleuette, the founder of Ms President US. Our panel discussion at the Ms President US program. I also went to the Ridgefield Library to meet with a group called Ms President US. 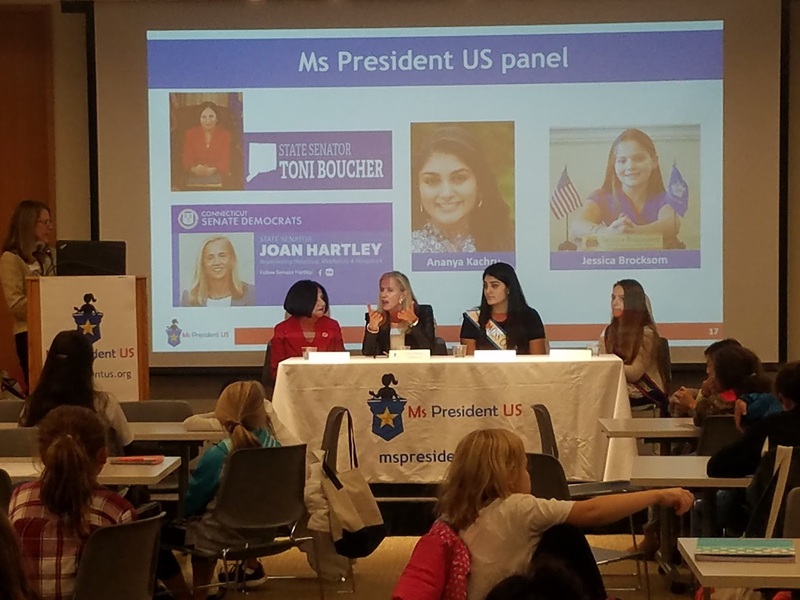 Ms President US is a group that encourages girls to play an important role in their community and inspires them to run for political office. 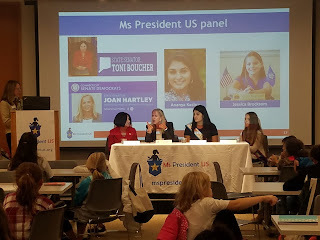 It was so cool to meet the girls and be a panelist along with Miss Connecticut Teen Ananya Kachru, Connecticut State Senator Toni Boucher, and Connecticut State Representatuve Joan Hartley. These other woman also have big roles and they are very inspiring. Thank you girls for all you do for people and animals. 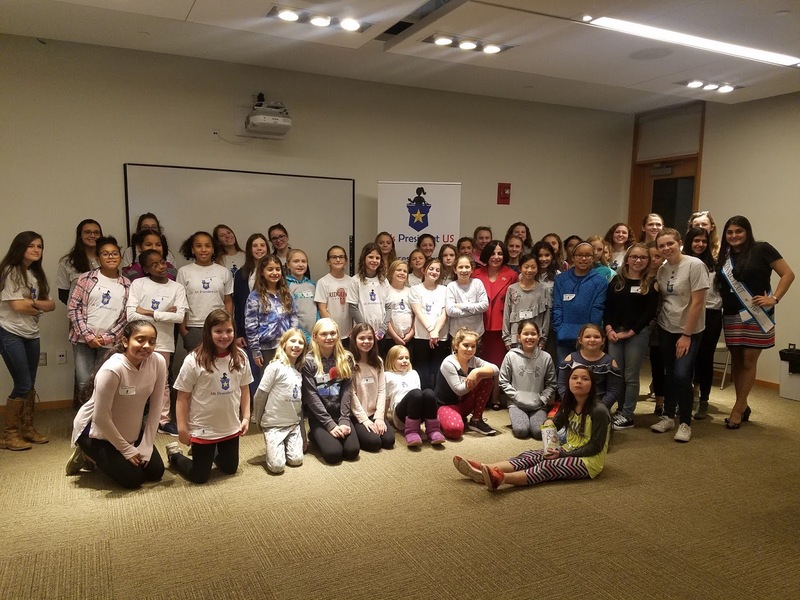 The elementary and middle school girls who attended the program! Make sure to email me all the great things you're doing at CKGJessica@kidgovernor.org. Have a great day and make sure to keep helping animals, those without a voice. Megan will be the third Connecticut's Kid Governor, succeeding Jessica Brocksom of Milford. Megan will be inaugurated in January at a ceremony at Connecticut's Old State House. 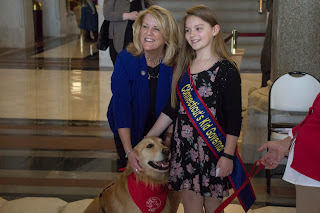 You can check out the Connecticut's Kid Governor website for updates and more information about Megan's term. Full coverage of the announcement of the 2018 Connecticut's Kid Governor. Megan's campaign video about cancer awareness. The Statewide Election for the 2018 Kid Governor is underway! The 2017 Statewide Election for the 2018 Connecticut’s Kid Governor is underway! After receiving a record-breaking number of nominees this year, seven students were selected to be this year’s Statewide Election Candidates. These students were nominated by the 5th graders in their schools and now it is YOUR turn to decide who will be the next Kid Governor! Each candidate has created a campaign video outlining why he or she wants to be Connecticut’s Kid Governor; what leadership qualities he/she has; what community issue is important to him or her and way; and a three-point plan outlining ways for Connecticut’s 5th graders to make a difference around that issue. You can watch the candidates’ campaign videos here. Good luck to all of the Connecticut’s Kid Governor candidates! Polls close on Tuesday, November 14 at 5:00pm. Look for the announcement of the next Kid Governor soon!